IT Manager’s Handbook, Third Edition, provides a practical reference that you will return to again and again in an ever-changing corporate environment where the demands on IT continue to increase. Make your first 100 days really count with the fundamental principles and core concepts critical to your success as a new IT Manager. This is a must-read for new IT managers and a great refresher for seasoned managers trying to maintain expertise in the rapidly changing IT world. This latest edition includes discussions on how to develop an overall IT strategy as well as demonstrate the value of IT to the company. It will teach you how to: manage your enterprise’s new level of connectivity with a new chapter covering social media, handheld devices, and more; implement and optimize cloud services to provide a better experience for your mobile and virtual workforce at a lower cost to your bottom line; integrate mobile applications into your company’s strategy; and manage the money, including topics such as department budgets and leasing versus buying. You will also learn how to work with your customers, whomever those might be for your IT shop; hire, train, and manage your team and their projects so that you come in on time and budget; and secure your systems to face some of today's most challenging security challenges. 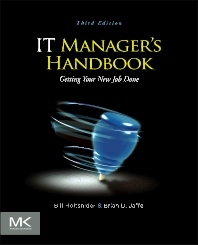 This book will appeal to new IT managers in all areas of specialty, including technical professionals who are transitioning into IT management. 1.1 Just What Does an IT Manager Do? 1.8 Two IT Departments—What Happens If Your Company Merges with Another? 7.3 TCO and Asset Management: What Are They? 11.3 How Does This Affect You as IT Manager?